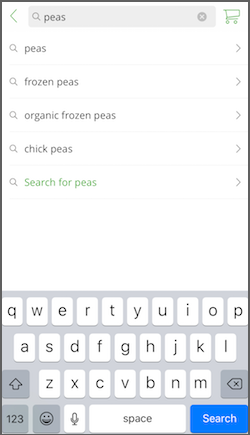 For best results, download the latest version of the Instacart app for iOS or Android. 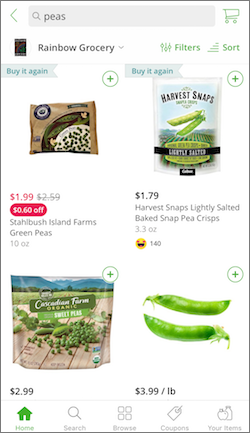 Finding the items you love on Instacart is easy! 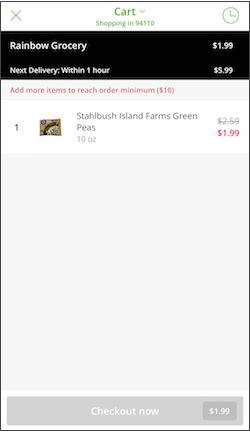 Here’s how to view item details and add items to your cart. 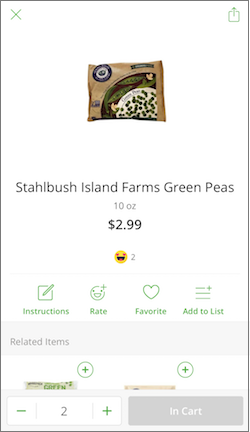 In the item window, you’ll see size and pricing information as well as the ratings from the Instacart customer community. Voila! The item is now in your cart. If your shopper is already working on your order, you’ll need to contact your shopper directly. For help contacting your shopper, click here. For more information about delivery, and tips for improving delivery instructions, click here. Enter item information, including quantity and where we can find it. Click Next. If you have a photo of the item on your mobile device, upload it here. The photo will be shared with the shopper working on your order. You are welcome to shop from multiple stores when placing an order. You’ll be taken to the store’s landing page. Browse, search, and add items to your cart as desired. Go back to the original store as desired using the same method. Toggle back to the original store as desired using the same method. In your cart, you will see items grouped by Store. Adding items to your cart from multiple stores will create a multiple delivery order. 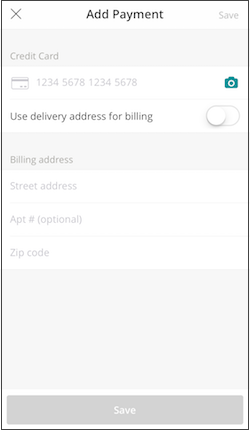 During online checkout, you will be prompted to select a delivery window for each store. 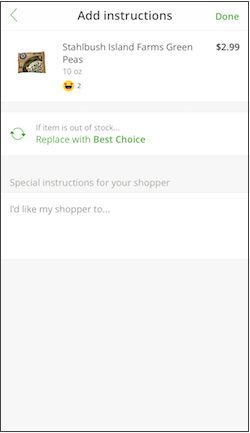 A separate shopper or set of shoppers will be connected to each store delivery. Keep in mind that delivery fees and minimums are applicable on a per-delivery basis, and each store requires a separate delivery. Any free delivery promos or credits require a $35 minimum per delivery. The $35 minimum applies for Express members as well. After delivery, you can review the order details by store. You will also be given the option to Rate your order and add a Tip. 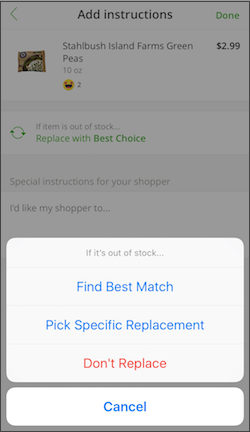 When placing a multiple store orders, your Rating and Tip will be applied once, and will cover all deliveries in the order. Why is more than one store is showing up in my order summary? I only want to order from one store. You may have added an item from a second store. Head back to your shopping cart, locate the item and remove it. Make sure you’re on the correct store page, then search for the item and, if available, you can add it to your cart. Why was I charged multiple delivery fees for my order? The Delivery fee applies to each delivery in an order. Since multiple stores in an order require multiple deliveries, the delivery fee and associated order minimums apply for each store in the order. Your cart will show the current next available delivery window for your store, and the item order amount needed to reach any order minimums. You can also view your item total, adjust item quantities, and remove items as needed. When you’re ready to place your order, visit your cart and tap Checkout now. Finally, you can review your delivery information and charges. When you’re ready to place the order, just tap Place order. Items listed in our online catalog are eligible for delivery. If you don’t see an item in our online catalog, you can make a special request. Item availability and terms are subject to change without notice. Alcohol is not available at all retailers and markets and we cannot fulfill special requests for alcohol items. 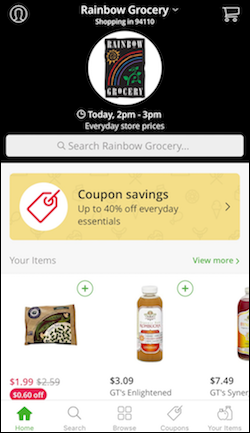 We have a feature that allows multiple Instacart account holders to shop together! 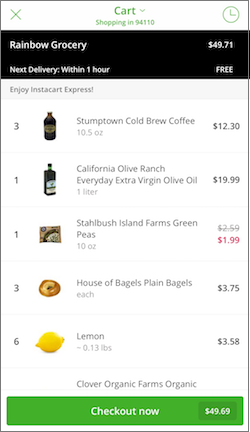 Create a cart and share it with your friends, and check out when you’re ready for delivery. Log into your account. You’ll be able to go straight to the cart. Toggle between your personal and group carts as needed! When the cart is ready, any member of the cart can select Checkout to place the order using their account payment method. At this time, payment cannot be split between cart members. You must be on a computer to do this! 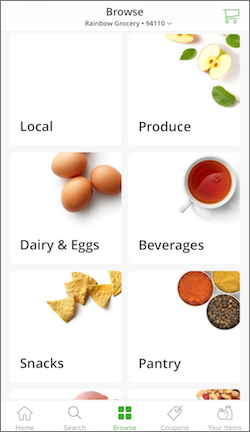 Alcohol is not available at all retailers in all markets on Instacart. We cannot fulfill Special Requests or replacements for alcohol items. 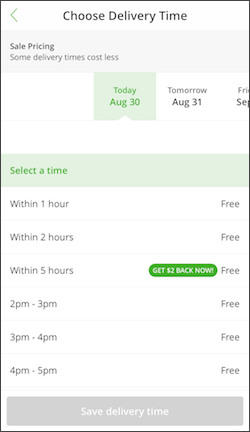 Customers ordering alcohol on Instacart will be required to provide their date of birth at checkout to confirm they are 21 or older. When the order is delivered, a recipient 21 or older must be present to sign for the delivery and show proof of legal age with a valid photo ID, as well. No orders containing alcohol will be delivered to any visibly intoxicated persons. No alcohol will be left unattended. If these requirements are not met at delivery, the alcohol items will not be delivered and the customer will not be charged for the value of the alcohol, excluding any delivery fees, bottle deposit fees or tip.